It is a very abundant source of Nirnroot. Leyawiin completely blocks the river, so it must be assumed that the water flows underground or through the sewers, because otherwise the city would act as a dam, and be completely flooded. 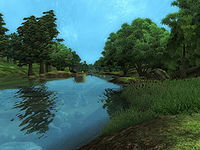 Water's Edge sits on its northwestern shore, with Rockmilk Cave a short distance to the north, and the Ayleid ruin Telepe and Undertow Cavern further south of Water's Edge. Fort Redman, Fisherman's Rock, and Amelion Tomb all sit on the eastern shores. Esta página foi modificada pela última vez à(s) 14h18min de 3 de janeiro de 2010.